Discussion in 'Solid Axle Swap Registry' started by exploregon94, April 16, 2017. 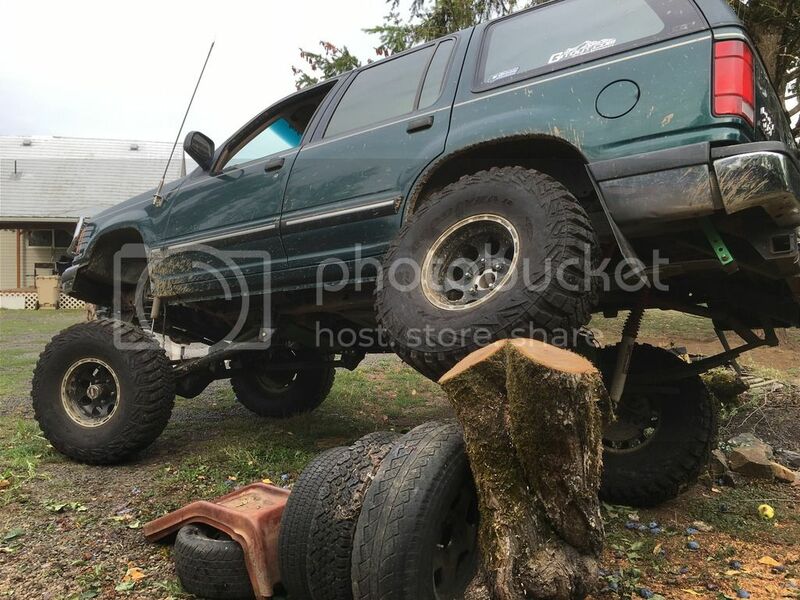 So I haven't officially made a thread on my lifted explorer build. It would have been easier to track from the beggining but I just didn't get around to posting. 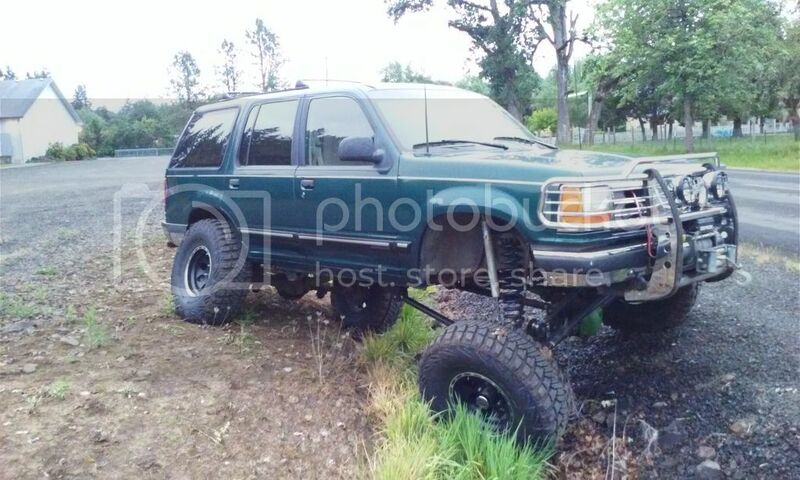 Iv had this 94 explorer since late 2013 when I picked it up for $700 bone stock. I used to have an 85 bronco 2 that I had chopped the top on and loved how well it wheeled and performed but it wasn't big enough and had tons of issues. So the explorer fit me much better. It's a 5 speed with when I got it 228,000 miles. Now it has around 236,000 miles. Has a light lifter knock when the oil is dirty but runs really darn good tho. I started with some TTB lift at a 3" and 33s. I had found a long arm kit in the junkyard on a bronco 2 and used that lift first. I ended up getting some skyjacker 8" drop brackets and some 6" super lift coils and drove it like that for about 8 months. After re aligning the front end about 6 times I got fed up and started collecting parts for an SAS swap to a What I thought I wanted D30 HP axle. After some research I scrapped that idea and found a 75 high pinion D44 axle. I then looked at suspension types. I wanted the maximum performance possible so I started looking at 3/4 link suspensions. After reading a boat load into it I started collecting more parts for the swap. I'm a pretty constructive guy so I went around the $1500 kits and started finding parts to build everything myself. Found a 20' stick of Dom, picked up some johny joints and ballistic bushings in the largest sizes I could find. I wanted a highsteer setup so I found some Chevy flat top knuckles, had them milled and drilled, studs. Started putting things together. Brand new moog ball joints, brand new just about everything. 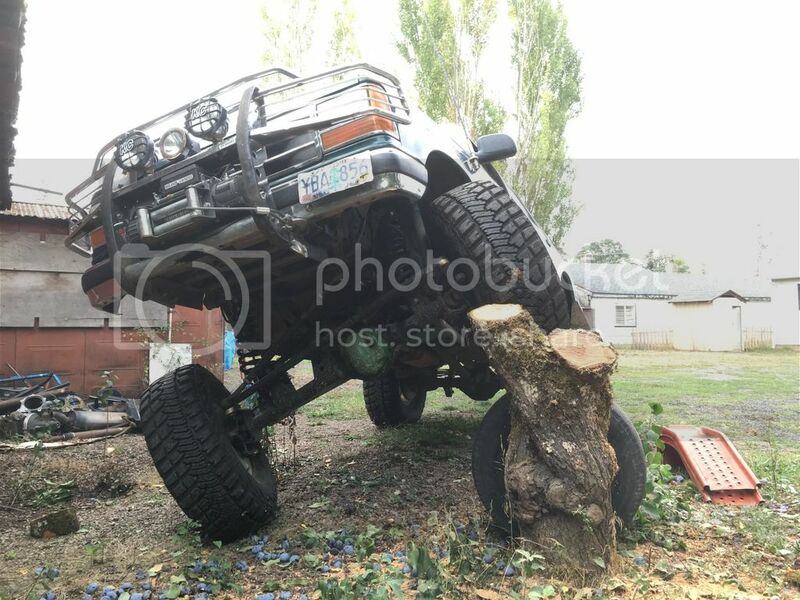 I didn't want a "full width axle" so I had my housing sent to a shop to cut it down three inches on the long side. Made it a 63" axle, also had the diff clocked up 8 degrees for driveline angle. After 5 months of a few hours at a time, I put together the SAS kit I had gathered and built. And bam. We have Dora. Here's some pics. Ford D44 High pinion axle w/ weld on C's. Axle cut down 3" on long side and clocked to 8 degrees. Chevy flat top knuckles and front brakes w/ Chevy earlie "skinny" spindles to fit Ford half ton outers to keep the lug pattern 5 on 5.5. Detroit true trac gear posi with 4.56 gears setup myself. Custom built 3 link suspension type. Got some weld together link parts from chassisunlimited.com. Got my johhny joints from eBay. Got my @frame link bushings from ballisticfab. I got high steer arms from eBay. 1ton steering 1" dom with moog 7/8" TRE's w/ lifetime warranty from Oreilys auto parts. I built custom lower link mounts to the frame via bolt on. I had to built a pretty stout upper link plate/cross member since I bent the first one I had built off the stock cross member, bad idea lol. I used skyjacker 138s 8" lift coils. The mount kit from chassis unlimited came with coilover mounts so I built coil seats out of stock TTB coil seats and some plate steel. I had to built "shock keeper slides" as I call them to keep the coils from wondering about when flexing because I hold my coils to the rig from the top mount, not from the bottom. Odd yes, functions quite well tho. I used 3 different Chevy 3/4 stock brake lines mated together to make long enough brake lines for the massive flex this thing has. I have heard a ton of horror stories with the steel braid ones so I decided to stay away from those. That pretty much covers all of the front end of the rig. The rear end of the rig is much simpler to explain. 97 31 spline disc brake rear axle swap. 4.56 gears with stock posi carrier. Got some shackles from Oreilys and added a stabilizer bar in the middle of them. Home brewed 1st gen/2nd gen mix leaf packs. No overload. 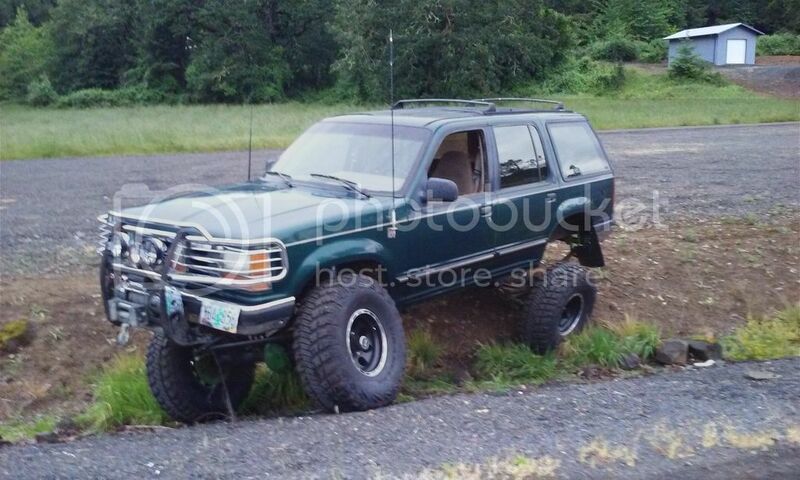 I'd say about 10" of lift in the rear and still using my stock rear driveline. It's quite impressive lol. Some other mods Iv done. Added a front winch. Just finished up the rear bumper build, pics to follow, the entire rig Inside and out has been completely converted to LED lights. I'm running a M5OD 5 speed and 1354 E t case currently. I'll post more photos tomorrow. 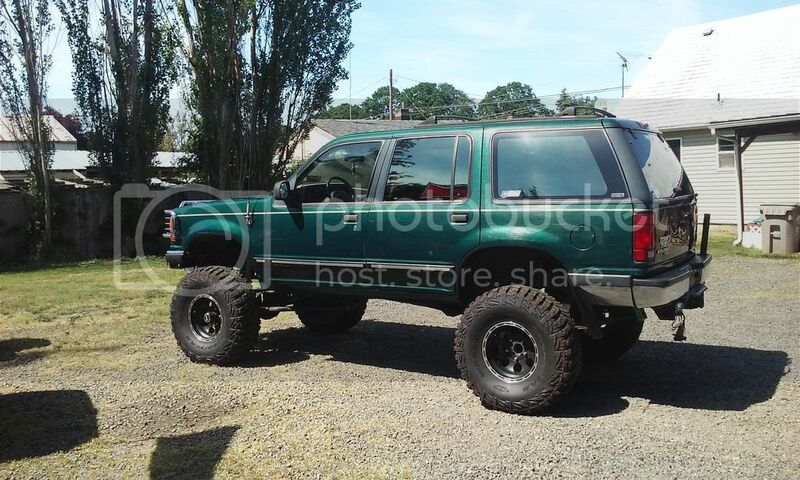 I just finished up a rear bumper build for it and am picking up some brand new irok 39.5" tires for it tomorrow. I'll have some pics of those when I get them on. This weekend a buddy and I are going to go find the deepest snow we can. That's why I'm getting some 39s, so I can go farther in the deep snow. so heres a few pics from today. Got my 39.5 Iroks from Discout tire. The wheels are 15x10 Mickey Thompson Classic Baja locks, 5 on 5.5 lug pattern. The total package with tire insurance ended up being $2200, nothing like working on that credit score. The front bumper is coming off this week to add a little more forward clearance. right now i can turn lock to lock without any rubbing. 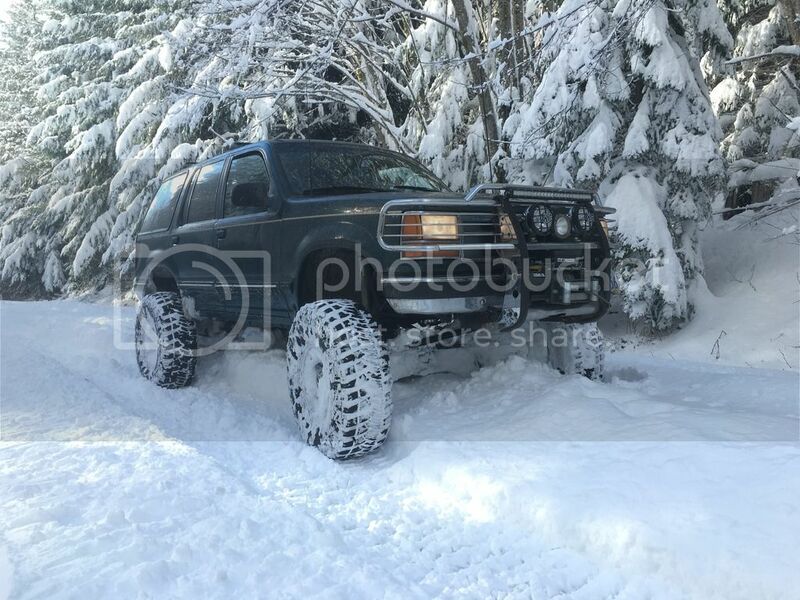 I know i wont be able to flex tho... thats ok, theyre soul purpose is floating Dora's enlarged behind over deep snow in the winter months (3/4 of the year here in oregon). first pic the tires are just set next to the rig. I didnt have time today to put them all on, I had to go fix my sisters brakes on her Chevy Cavalier. Im gonna post up the rear bumper I just build in the last two weeks. I think it turned out great. Does everything I need it to do for the most part. Still working on the license plate light situation. I had it put together then put the spare tire on and it broke the plastic piece i had for the light holder. I started with a large 3"x8"x72" piece of 3/16ths rectangular steel I got from Cherry City metals in salem for $46 dollars. I picked up several pieces of 3" 3/16ths flat bar for $11 to add to the bumper later. The D ring Mounts are Just some 1/2" thick Triangles I got from a friend a while back and wasnt sure what i was going to use them for till this build. Had to drill the holes out, that took quite a while. The pivot idea was created from a failed attempt a while back at a swing arm style that didnt work out. Figured I could make this work fairly easier with my Fab skills being novice. About $10 in hardware from the local hardware, about a 40 3/16ths welding rods to zip it all together. My friend Luke helped me build it, he used a plaz to make the general shape of it. Took me about 2 weeks total time to put it all together. Heres some of the build pics. Could you post some pics of your upper 3rd link mounting? Great photos. Could you post some detailed photos of your 3 link setup from frame to axle and a front shot showing your panhard and steering. spudhut. not sure how far you have gotten in the year I haven't replied since you posted but here soon I'm going to be install 5.13 gears and a Yukon grizzly locker in the rear of my rig. I can probably get you those photos around that time which will be probably In a week or two depending on when parts show up. Man I love this truck! stock rear driveshaft? and still rockin electronic shift t case!! Well done, she looks great. Winter is coming.....slowly....looks like you will be ready! What's the deal with the chevy flat tops and skinny spindles?